Working collaboratively with our 26 higher education institution (HEI) members, together with our established links with schools, colleges and local authorities, AccessHE enables our stakeholders to achieve their objectives on supporting under-represented groups throughout their higher education (HE) learner journeys. AccessHE is working with partners in London to deliver the London element of the National Collaborative Outreach Programme (NCOP). With funding from the Office for Students, the London NCOP is seeking to increase the number of young people from under-represented groups who go into HE. NCOP involves designing, developing and delivering innovative, engaging events and activities for young people in years 9-13. Moreover, we are also monitoring and evaluating the success of these initiatives to identify and report on what works to help inform future policy developments. AccessHE is now looking to appoint an experienced delivery professional on a consultancy basis to deliver sessions on HE progression with learners in schools who are part of the London NCOP in the London Boroughs of Barking & Dagenham and Havering with identified cohorts of learners from Years 9, 10, 11, 12 and 13 respectively in each school. An effective and enthusiastic communicator, you will be confident in engaging young people and their influencers in the transformative opportunities offered by higher education. You will be able to demonstrate an understanding of the higher education sector and share in our commitment to supporting progression of under-represented groups in education. 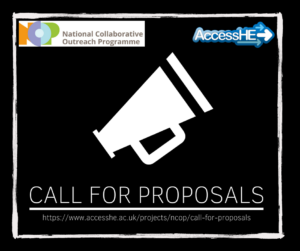 If you would like to know more, please download our Call for Proposals document below, together with our Proposal Form. Please note the deadline for the return of proposals is 5pm on Monday 3 September 2018.